Is there a place in your budget that can use a little help? Most of us have weak spots or areas that we just don’t see as an issue. 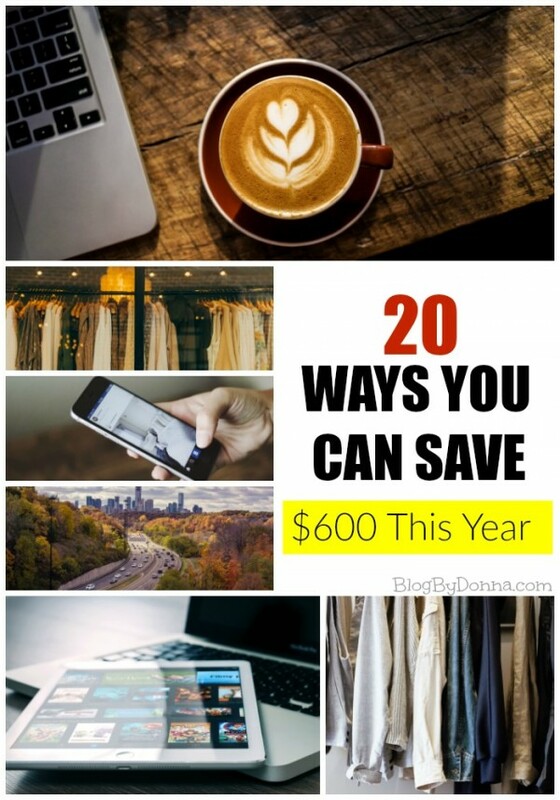 If you feel like you need to save a little bit more, here are some tips to help you save $600 this year! How much do you spend on your daily latte? $3.00? $5.00? If you are doing this 5 days per week, this is a huge expense throughout the month (up to $100 per month!). Make your own coffee at home and save up to $1000 or more this year. Many people spend $100+ per month on satellite and/or cable. Instead of paying this, you can sign up for Netflix at $8 per month and have thousands of movies and TV shows to watch. Do you have Amazon Prime? Amazon also has a great selection of movies and shows to stream. Try Amazon Prime 30-Day Free Trial . Gym memberships cost a lot of money. Buy some great workout DVDs (or stream them on your Netflix or Amazon account) and work out at home for free! Or hit your neighborhood walking trails to get a great outdoor workout. Sticking to a grocery list is a simple way to stay on budget. Having a list prevents you from impulse shopping which can destroy your budget. You don’t have to be an extreme couponer to save money with coupons. Before you head out shopping, take a look at your list and check out coupons.com to see if any coupons match up. You can really save a lot with this simple step. Cutting junk food out of your life can not only help get you healthy, but it can keep your wallet healthy as well. If you are clothes shopping, check out the clearance section. When you do head out to shop for new clothes, be sure to hit the sales and clearance racks. Oh…and do an internet search for coupons for the store you are heading to, sometimes they will surprise you with mobile coupons. If you shop online, take advantage of sites like TopCashback.com and earn cash back and discounts to over 3,500 online stores. I use it and it does work/help. Carpooling with others for your daily commute can save a lot of money on your gas bills and parking fees. Compare your car insurance with other companies. You know those commercials you see that say that calling to compare can save you money? They don’t lie, sometimes you can save a lot with just one phone call. It pays to shop around. Chances are, you will find some stuff to sell while you are getting organized. You can take items to a cosignment shop or have a yard sale. Packing your own lunches instead of eating out every day is healthier and will save money. Call and schedule an energy audit. Most power companies offer free or cheap energy audits. These can tell you where you may be lacking in energy efficiency. Follow their tips to bring down your power bill. Choose fluorescent or LED light bulbs. It’s the law now anyway, but this is another great way to cut down on your energy bills. Lowering your thermostat just a couple of degrees can save you money! Similar to lowering your water heater temperature, turning the heat down on your furnace can add up to big saving. Bulk shopping can save big in the long run. Buying staples such as rice, beans, oatmeal, flour and sugar in bulk can often save you 50% or more over buying the packaged items. Call your cell phone company and ask for any specials that you may qualify for. I recently placed a call and was able to cut $15 from my monthly bill. Sign up for your grocery store club card. Many grocery stores have club card memberships that add automatic savings to your account. Invest in a reusable water bottle. The cost of constantly buying bottled water adds up. Invest in a good quality (BPA Free) reusable water bottle and use the tap instead to save big. Frugal Date Nights. Instead of going all out for date night, choose to stay in a watch a movie or check out sites like Groupon to find good deals on restaurants and activities. If you take these 20 ideas and put them in action you can save $600 this year, maybe even more. I promise you if you spend less, you can save money. It really IS that simple. Great ideas, thanks! Me and my wife always appreciate more smart ways in managing our finances. These are awesome ways to save $600 i love these ideas, especially for people experiencing financial issues.